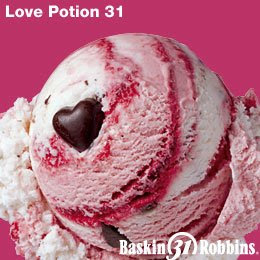 If it's February, I must be eating my favourite ice cream - Love Potion #31 from Baskin-Robbins. It is to die for! Described as "Cupid’s white chocolate and raspberry ice creams swirled with a raspberry ribbon and loaded with raspberry-filled hearts and chocolate chips", it is only available at Valentine's Day. So hurry and get some soon.